Hezbollah Brigades transporting an M1 Abrams in its possession around Jan. 2015. 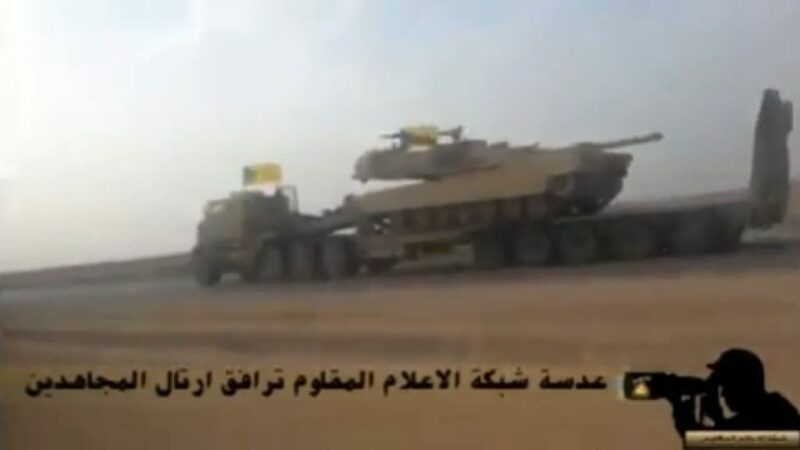 A recent quarterly report released by the Office of Inspector General acknowledged that several US-made Abrams tanks fell into the hands of Iranian-backed militias after being supplied to the Iraqi military. The report stated that “some U.S.-provided military equipment sent to support the mission, including as many as nine M1 Abrams tanks, had fallen into the hands of Iranian-backed militias that fought against ISIS [Islamic State] in Iraq.” The report also noted that the US State Department has pressed the Iraqi government for the return of the tanks, but that has not happened. The Iraqi government has relied on the Popular Mobilization Forces (PMF), the grouping of militias mostly backed by Iran, to liberate cities such as Mosul, Ramadi, Fallujah, Tikrit and Baiji, Hawija, Al Qaim from the Islamic State. The PMF has also battled Kurdish militias in Kirkuk. Hezbollah Brigades, Badr Organization, and Kata’ib Sayyid al Shuhada are three of the more prominent militias under the PMF umbrella. PMF militias have banded together and formed a political coalition called al-Fatah al Mubin (Manifest Victory) to contest the Iraq’s upcoming parliamentary elections in May. According to reports they have returned to the Iraqi army. One would hope that when these units appear in the open, that they would occasionally get vaporized. Not all of them, perhaps 1 in 5, sufficient to amp up the adrenaline for the remaining tank crews. Continue that campaign of intermittent and unpredictable attrition for a number of months and see how often they deploy after that. what hasn’t the Obama administration provided the Iranians? billions in cash? check. pathway to nuclear weapons? check. free license to sell drugs in the US? check. now these tanks, which they’ll just reverse engineer and manufacture themselves just like the drone. smh. I served in the U.S. Army for 7 years. I don’t understand the phrase “fallen into the the hands” I always had to acccount for my M16. I think this was sold or given to the “bad guys”. Punishment for TREASON is in order. Find the tanks. Blow them up in place or recover by any means necessary. This is the next story. It was likely abandoned by the Iraqi Army in the early outbreak of the war. They had a big problem with that. They’ve also lost several in battle, so it’s not outlandish to think that these guys probably have spare parts. It’s not that big of a deal. They are export models. Different war, different rules; we supplied the Iraqi Army in order for Iraqis to fight. Once the equipment is given to the Iraqi Army, the US no longer controls, only tracks equipment. The tracking is based on what the Iraqis report. This is just to add context to the article. These tanks were provided by the Obama administration to the Iraqi armed forces as part of arming the nation against IS. Iraq then either supplied them to these terrorists, or they were stolen from the Iraqi army by the terrorists. The first step is reasonably benign in itself, though given that the second step could, even should, have been anticipated, I don’t think it was a particularly good idea and hope that the hardware supplied was old stock, outdated equipment that had been sitting in long term mobilisation reserve storage for a long time (so M1s, not M1A1s let alone M1A2s). Has the military gotten that stupid they can’t keep our top of the line equipment out of the hands of our enemies. What is their major malfunction? Either the Tanks were sold by the corrupt Iraquis or captured by ISIS and Iranians when the fat cowards of the “so called” Iraqui Army ran enmass in the face of incoming ISIS without firing a shot. Just kill off these tanks. Wait, hold on a second. We knew this the entire time. The minute we crossed the border from Kuwait to install a democracy we handed this nation to Iran. We sent tanks in full knowledge Iran was playing around. We gave air support to the Iran backed militias through the proxy of the Iraqi army. Are we still training the Shia army of Iraq? What is wrong with us? Twenty-one trillion down and picking up speed. How much does anyone want to bet two of those missing M1’s are in Russia via Iran and will never be returned or accounted for? Vivisection in the tank yards. Have the Russians had the chance to get their hands on one in the past or was this their first chance? I imagine Egypt’s are accounted for. Didn’t the Obama Administration also provide tanks to the Lebanese Army aka Hezbollah? Strange how the killers of American armed forces seem to get supplied with our best equipment for the “fight against terrorism”. US can build in self-destruct capability in our civilian rocket launch vehicles. Can we not put in hidden, remotely-activated “viruses” (software or kinetic) in military equipment that we give to untrustworthy “allies” so we can put them out of action. Would be interesting if we could. Comments regarding previous administrations, whether they are accurate or not, are reflective of a much greater problem facing the United States. Our foreign policy is increasingly reactive domestic political forces. While this has always been the case to some degree, the last few decades have seen us become generally ineffective. How often have we tried to train and equip militaries of ineffective governments between 1968 and today? How often has that worked? Since we have abandoned the draft, we have a more professional military, but we also have made the political consequences of deploying that military significantly lighter. Our populace and politicians have little skin in the game. The result is that we have a warrior caste which can be used for short term political gain. So we engage in military adventures for dubious gain and we retreat from our global commitments the moment anyone’s career may be at risk. The same can be said for career progression and promotion within the services. Our adversaries know this. While we have the best trained and most lethal military the world has ever seen, as a nation we lack anything resembling strategy or resolve. The reason we lose wars and keep losing wars, is us. Until we, as Americans, collectively decide what is and is not important, we are in no position to fight. As an side, Athens faced this exact problem at the end of the Peloponnesian wars, leading to disastrous expeditions to Syracuse. Eventually Athens was crushed. A few years later Athens was re-taken and returned to greatness while upholding the principals which eventually gave us the democratic order we enjoy today. So there is hope. We, the democratic people of the world, have been in worse situations. Looks like the Iraqis wont be needing the M-1. That is too bad because America was looking to spend billions of dollars to do it. I wonder if Russia gave them, sold them or traded them? So we not only train them we actually still equip them… Great. These 24 battalions are only some of the units that they want American taxpayers to equip down to their underwear. We’ve been supplying the “reconstituted” Iraqi Army with US and Western equipment since I was there in 2005-06. After they elected a Shiite government in 2006 it should be no surprise that they handed off equipment to their co-religionists. Don’t blame Obama for policies planned and executed by the Bush administration.